I have been absolutely lusting after a pair of glitter boots for a while, but I never quite found a pair that I liked enough. They were always either too stiff, hit me at the wrong spot on the ankle, or just had uncomfortable heel heights or widths. I also never thought that I would be able to pull off a sock boot because I don't particularly like the look of tight boots with skinny jeans, but since I've pretty much stopped wearing any jeans that weren't boyfriend/mom/kick-flares, I don't have to worry about that concern anymore! 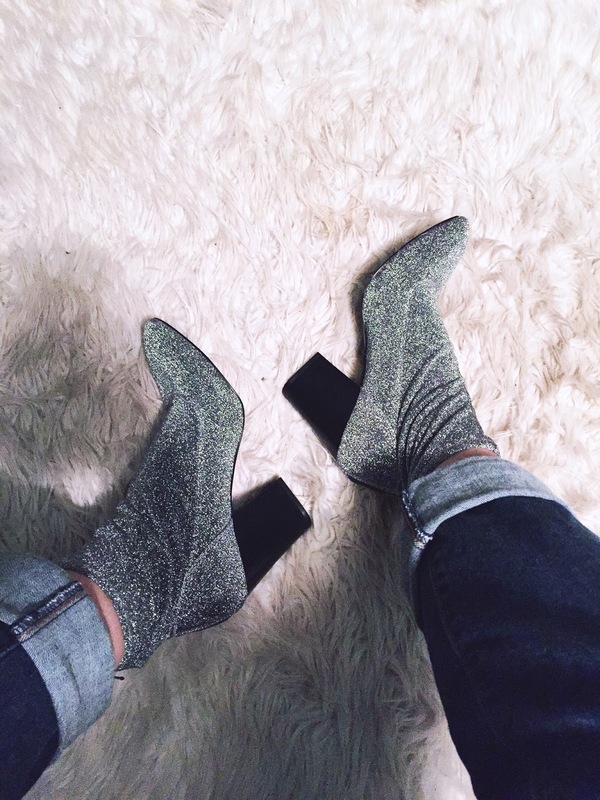 So, I finally got the glitter sock boots of my dream from Nine West at the Saks Outlet because when do I ever get things when they're not from an outlet or secondhand? Anyways, they're just as glorious as they look. Peep them in this Instagram because I wore them to Niall Horan's concert on Halloween (#StillNotACostume) and maybe follow me there so you can see me continue to style them in most likely weird ways. I don't binge-watch television shows. I'm just, not great at it if I'm being honest. I really have to be in the mood, ya know? Similar to when I read books, I have to finish in a fairly short period of time or I won't remember to finish watching. Trying to get this align to my mood to sit down and watch shows for hours and hours on end is rare. However, last Sunday, the moment struck and I decided in the moment that I was going to watch the show that I've been falsely claiming I was going to watch when people told me I would like it because I always say "I'll put it on my list" but I rarely ever mean it. Anyways, less about me being actual trash and more about me now being Riverdale trash. I watched the entirety of the first season and caught up on the second season in a twenty-four hour period (haven't watched Wednesday's episode yet though, no spoilers!). Truly, I knew that within the first few minutes when I saw KJ Apa's abs that I was going to have to finish this show no matter what happened plotwise. And like, everyone else is cool too but like...KJ's abs, y'all. They called out to me...they drew me in...it was a hook, line, and sink all the way baby. Anyways, the show is cool. It's a murder mystery teen drama that has a lot of crazy stuff going on in this creepy little town. I mean, you just gotta watch it, honestly. Don't be me and say you will from the start and then never do it. Or, I guess be me because I did watch it eventually? I have been a massive John Green fan since I read Looking for Alaska in middle school. He's my jam and probably one of my favorite authors if I'm being honest. I know people always have their own things to say about him, but I love the way he writes smart teenagers and I just think he's a really top-notch, intelligent, and kind dude who just wants to write books and hang with his family. I digress beyond the author himself, this has been a pretty highly anticipated book, at least for me (and I'm assuming for many, especially after The Fault In Our Stars hype). Two of Green's books have been turned into blockbuster films and after that, the pressure is on. 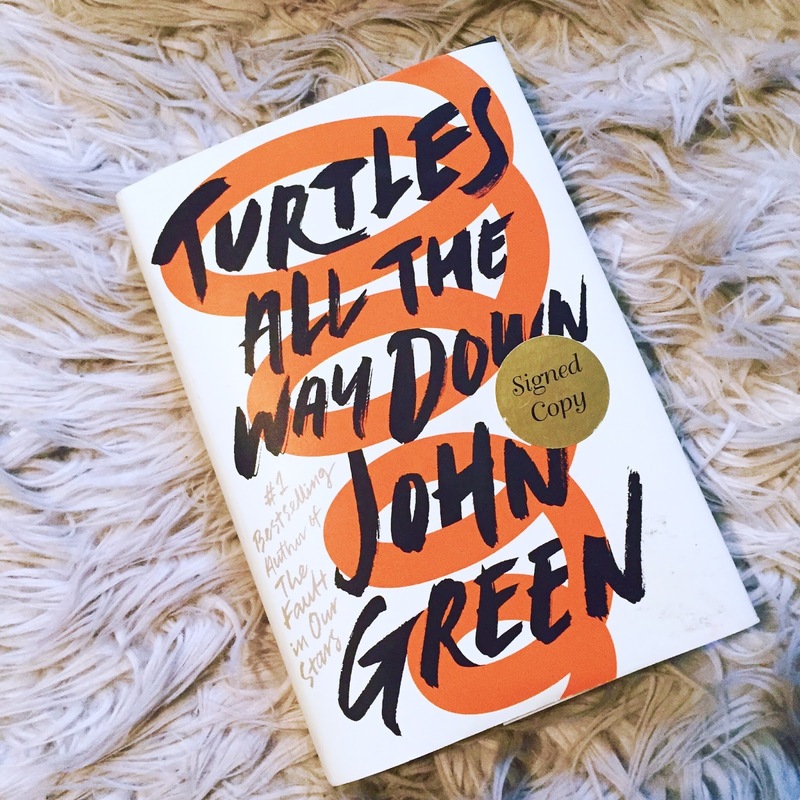 Turtles All the Way Down somehow is and isn't a typical John Green book. It has the intelligent teenagers and solid, well-developed characters. But it also lacked the usual romance and singular, large plot. Instead, the book relied on two subtle plots, one being an unsolved disappearance in town and another being the struggle and development of the narrator, Aza's anxiety and OCD. Real OCD that sends you down a mental spiral of endless questions and worries, not a teenage girl who likes things to be organized in a certain way. It doesn't trivialize mental health. Instead, it gives it a moving and authentic portrayal. I'm not one to cry reading books. I didn't even cry when I read The Fault In Our Stars, only when I watched the film. I knew it was sad, but I couldn't get myself to produce the tears during the actual reading of the book. I read Turtles All the Way Down on a train ride to New York City in a singular sitting and cried a total of three times. Do you ever read a book that hits you so close to home that the only proper reaction is to just let a few tears fall to make yourself feel better? It wasn't even from sadness, it was more out of feeling like I was being recognized in a written work. It felt like finally there was a character that I could understand and that could understand me. Books that approach mental health can go either way. I applaud John Green for his portrayal of Aza's anxiety. It was believable and tough to read, but it wasn't intensely dramatized and used as an entertaining plot point. You know how sometimes writers just assign various things to characters for drama and don't actually put in the effort to properly research whatever it is because it's only there to "spice it up?" Aza's anxiety didn't feel like this. It was heart-breaking and believable and all around well done.